This news bulletin describes two landmine incidents occurring in February and June 2013 in Mone Township, Nyaunglebin District. 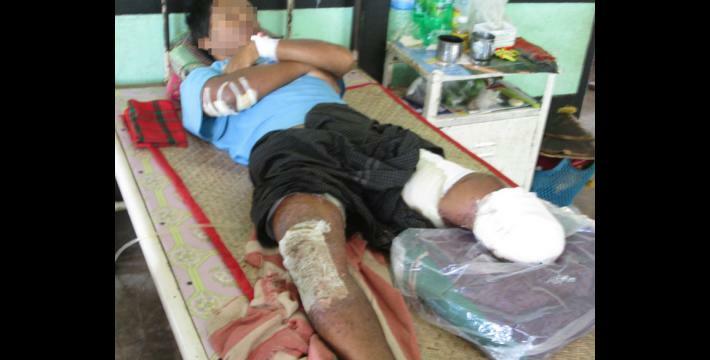 On February 2nd 2013, 22-year-old Saw H--- from S--- village was walking home after collecting firewood in Maw Lay Forest when he stepped on a landmine, sustaining temporary injuries to his leg. 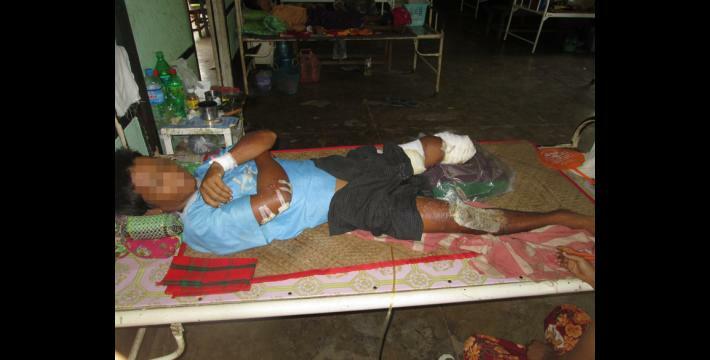 On June 1st, 45-year-old Maung W--- stepped on a landmine at Chauck Kway. The landmine shrapnel caused major damage to his left leg, and it was amputated as a result. In both incidents, landmines were detonated on frequently used paths, indicating that the mines were likely to have been planted recently. Based on the information submitted from the community member, the Tatmadaw and KNLA are active in these areas, but it is not clear which actor is responsible for originally planting the mines in either incident. This bulletin is based on information submitted to KHRG in February and June 2013 by a community member in Nyaunglebin District who has been trained by KHRG to monitor human rights conditions. On February 2nd 2013, at approximately 9:30 am, 22-year-old Saw H--- stepped on a landmine. Saw H--- is from S--- village in Kyoh Pay Say village tract, Mone Township. Saw H--- was on his way home from gathering firewood in Maw Lay Forest (know as Kyaung Pya Forest in Burmese) when he stepped on a landmine. The landmine detonated in the middle of an oxcart road, which is used by villagers to travel. A Tatmadaw camp and a Karen National Liberation Army (KNLA) camp are situated in the area; LIB #599 is based at the Tatmadaw camp and KNLA Column #1, under the control of KNLA Battalion #8, is based at the KNLA camp. 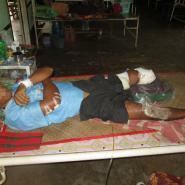 The villager was hit by the landmine in between the two aforementioned military camps; it remains unclear whether the landmine was planted by KNLA or Tatmadaw soldiers, or when it was planted. The landmine hit the left side of Saw H---'s foot and caused a deep gash, but according to a doctor, did not need to be amputated. Other villagers and buffalos were reportedly walking along the same path, with oxcarts driving both behind and in front of Saw H--- when the landmine detonated. 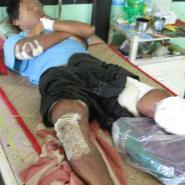 On June 1st 2013, at 10:00 am, Maung W--- stepped on a landmine at Chauck Kway while traveling along the road. Maung W--- is an ethnic Burmese villager from N--- village, Mone Township, Nyaunglebin District. His parents are U Ht--- and Daw K---. Chauck Kway is known locally as the sixth bend in the road between two Tatmadaw army camps, Ket Pe and Pa Dah. Because of the impact from the landmine explosion, his left leg was severely injured and required amputation. Soldiers from Tatmadaw LIB #60 sent him to Kyauk Kyi Hospital, where he is receiving treatment. He has not received any financial assistance for the treatment. The KHRG community member reported that the Tatmadaw and KNLA have planted landmines in the area, however, as with the case involving Saw H---, it is unknown which party is responsible for the landmine that struck Maung W---. This information was received over the phone right after the incident in February 2013 from a community member trained by KHRG from Nyaunglebin District. This information was received over the phone with KHRG in June 2013 from a community member from Nyaunglebin District.